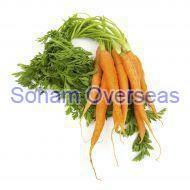 Fresh Carrot Supplier In Gujarat - Get Best Price! Enriched with beta-carotene and vitamin A, fresh carrots are paramount for a strong eye-sight and a healthy digestive system. Extensively used for making juices, savories, rice, pasta, carrot cakes, and desserts, the fresh carrot suppliers in Gujarat encounter a massive demand for this red veggie. For procuring the best-in-class carrots, get in touch with the sales team of Soham Overseas, as we offer an AA grade carrot at the utmost competitive rates. Our offered range is grown with the aid of modern techniques in a hygienic environment. We offer it in a food-grade packaging so that the shelf life and nutritional value of the carrots do not get hampered during the transit.